Curling has a new ambassador — Mr. T. Ever since the start of the Winter Olympics he's been glued to the sport — and has been tweeting feverishly about his newfound love. This story was originally published Feb. 16, 2018. He became a household hero as part of The A-Team. He headlined Wrestlemania. He boxed with Rocky as Clubber Lang. 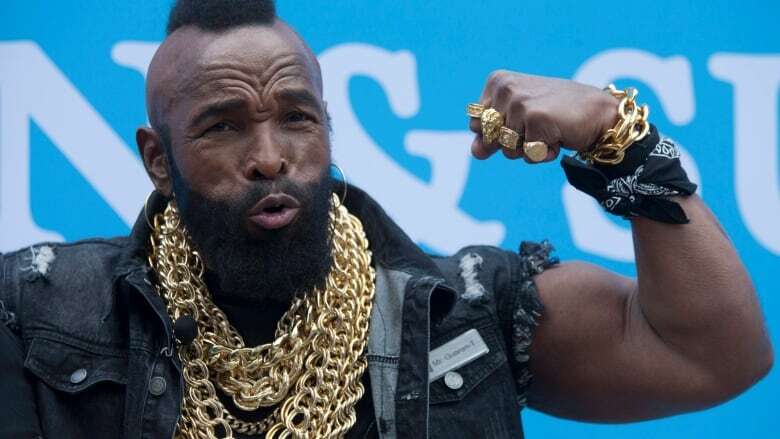 And now, the inimitable Mr. T has found notoriety, as a new and vocal fan of curling. "I'm embarrassed by all this attention," Mr. T told CBC Radio's As It Happens host Carol Off. On Tuesday, Mr. T praised the Canadian mixed doubles curling team for winning gold in the competition. He then lauded the athletes and the sport, introducing the hashtag #curlingiscoolfool. "I like how they release the stone. Wow! They make it look so effortless, and then how the sweepers move down the line and not touch the stones — wow! That takes practice," he said. Mr. T swept aside any suggestions that a renowned tough guy like him would be out of place at a curling rink, watching a sport seemingly unable to break away from the image of polite Canadians gliding smoothly along the ice. "That's controlled mayhem," he said, about the performances of athletes like Canadians Kaitlyn Lawes and John Morris. Their performances exemplified a measured display of power and skill that he said he tries to display himself. "I like the finesse, and the cool, and the calmness of everything. I like the strategy." Mr. T declined to comment directly on the latest controversy in the sport, when Canadian women's curling skip Rachel Homan removed a burned stone from the rink in their match against Denmark. But he did commend the sport's emphasis on sportsmanship and respect. "As I was taught, you win with modesty, you lose with dignity. My TV persona goes 'pity the fool' this and that, but deep inside it's humility. And notice, I said humili-T. Like responsibili-T," he said. He takes exception to the way some commentators have co-opted his signature catchphrase, however — he does not, in fact, pity the fool who doesn't like curling. "It's not for everybody. A lot of people, I'm sure, between me and you, deep down inside, they would like to try curling. But they know there's a lot more to it," he said. "I always tell people to try something before you knock it." Mr. T acknowledges that as a newcomer, he still has a lot to learn about the rules, techniques and traditions that are baked into the sport. But he's already taking notes and contemplating whether he'll be able to take to the ice himself some day. "I know I'm not that light on my feet to miss someone else's stone. It'd be a total mess. It'd be like the Three Stooges if I was trying to sweep the stone down, [and if I] fall. They'd be taking pictures and they'd be selling them on the internet. I'd be the joke of the town," he said.